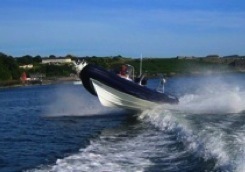 Cork Powerboat Training – Cork’s only dedicated powerboat training facility. Cork’s only dedicated powerboat training facility. Welcome to Cork Powerboat Training, Cork’s only dedicated Powerboat and Marine VHF training facility. We offer courses from the Irish Sailing Association’s (ISA) powerboat scheme, and we are a Department of Transport approved VHF Training Centre. Courses can be scheduled to suit your spare time, be that midweek, evenings or the weekend. We also offer students the chance to build hours with time on the water with an instructor. We also organise trips to help build you experience and build up your local knowledge. Feel free to contact us to discuss your requirements and we will be happy to accommodate you. To see forthcoming courses check the Calendar. We may not have the cheapest prices out there but we include all costs in our courses, we do not believe in hidden costs. We prefer you to contact us in relation to pricing as we can then discuss your requirements and training needs and arrange a suitable price for you to achieve your training needs. We are now part of the RNLI ambassador scheme and offer 12 months free membership of the RNLI on most of our courses.